Adjust multiple security rules at once (Plus Edition). Reflect network parameter changes and adjust the permissions accordingly (Plus Edition). Configure the Default zone for unlisted (yet) programs (Plus Edition). Configure the AllApplications zone (Plus Edition). Enable/Disable unlisted programs detection prompt/popup. Control Windows Task Bar integration, showing the permanent Task Bar button. Protect from unauthorized opening the panel with password. Configure programs detection notification sound. Export/Import (backup/restore) the entire settings. Any initial access attempt of an unlisted program is blocked. The blocking is vital for initial program detection. When a program is detected the program is set with Default Zone immediately. The user is prompted to choose/set a proper security zone to the program then. Windows 10 Firewall Control does not suspend the program network access attempt until user sets network permissions to a detected program. The Edit button allows to adjust the zone (change the security rules) in-place and save the results to Default Zone only or to the Zones repository as well. The zone is a set of rules applied to all the programs at once, not to a particular program. The applicationless rules allow enabling/disabling VPN access for all programs at once, for instance. The rules act at a low priority; so any rule set to a program directly/explicitly (either enabling or disabling) takes precedence. In other words, the rules (in the context of a program) trigger if the program has no its own rules to enable or disable the same IP/protocol/port only. If a program is set with such rules, the programs rules are used instead. 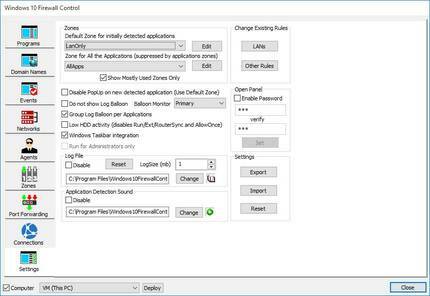 The Edit button allows to adjust the zone (change the security rules) in-place and save the results to All Applications Zone only or to the repository as well. Computer network connection may be altered; Internet provider can be changed or a network adapter can be installed, removed, switched on or off, the network connection parameters are changed as the result. The LANs button allows reflecting new network environment to all the zones of the programs and the zone repository at once. Pressing the button Windows 10 Firewall Control collects all active network interfaces parameters into the single list and allows editing the parameters. Each network interface found is appended with the LAN prefix. All the network interfaces are represented as a list of separate access rules as the result. After the list editing is finished all existing rules with the same prefix will be replaced with the new rules set. The options allows you keeping the same security settings for the programs in a new connection environment. The button allows collecting of all the rules from all the zones/programs and editing the rules in the single list. The option allows updating 1+ rules with corresponding names in all the zones and all the programs at once. For example, you set a special rule for disk sharing access control. The rule is used in multiple zones enabling/disabling specific details of the shared media access for various programs individually. If the environment is changed, there is a need to reflect the changes in all the zones at once. 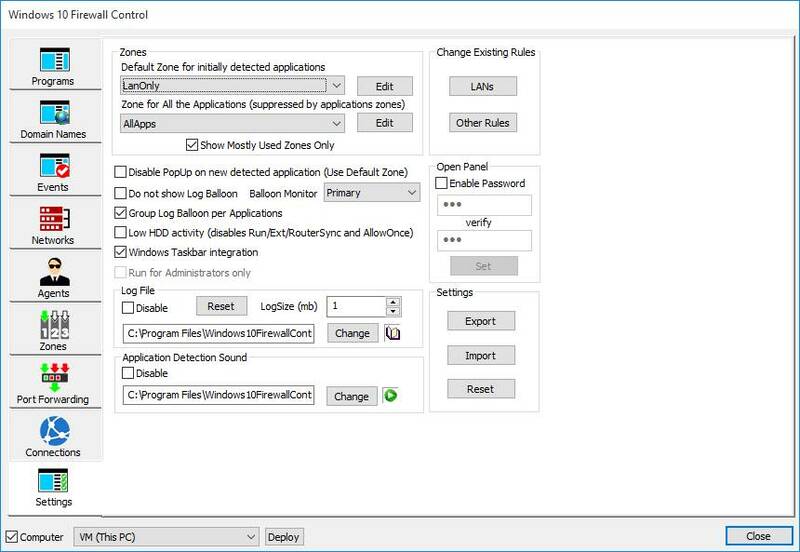 Using the option the corresponding rules can be found, edited and the changes will be distributed to all the zones and programs the rules are used in. The Log File option allows saving the event notifications into a chosen text file. The LogSize option limits the log file length by keeping the latest log entries only. The log file name has to be re-assigned (even with the same name) in order to alter the log size. The file will be re-opened and set with the new size limit. "LogReset" truncates the log file to the zero size.